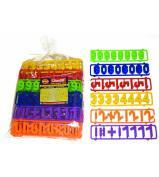 This Quercetti Set is made up in our Warehouse and contains 288 magnetic numbers, all with ridged edges, in an assortment of 6 colours and contains mathematical symbols. 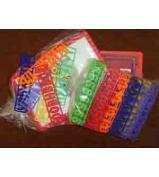 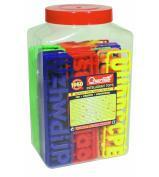 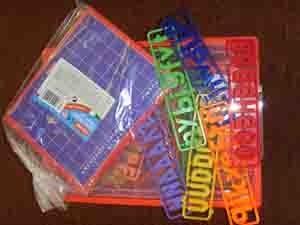 Also contains 240 lower case magnetic letters and 48 upper case letters in assorted colours. 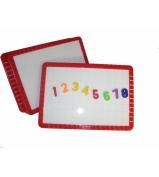 Also contains a pack of 6 small double sided magnetic boards, one side for use with magnetic numbers, letters and shapes or to write with chalks, the other side for use with dry-erase markers. 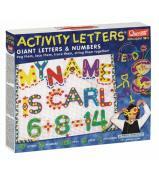 This set is a big, bulk classroom set, ideal for groups of children and comes in a deep red tray.